I'm kinda loving this boldly chic look right now! It's the perfect statement color, if you want to go a little bold. and, I love how it is a transitional color into Fall! If you haven't checked out Style Lately.. please go do so!! with these combos, scroll through below!! This is precious (and kind of inspiring!) lol - love the colors! Was scrolling through the other options you put at the end of your post. I love the swimsuit, where did you find it?? Love these looks! And the color is simply perfect. we have those lace shorts in tan and those sandals are my favorite for Breanna!! You two are absolutely beautiful! 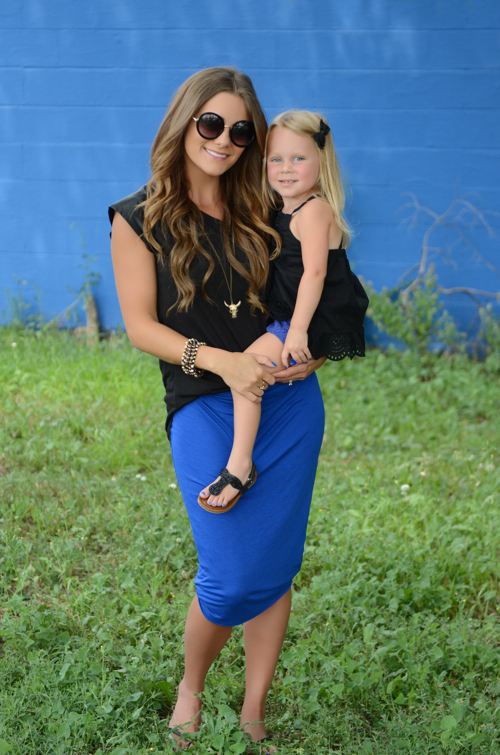 Love the matchy matchy :) And the black with the cobalt looks great. You guys are SO precious!!! You need to see if you can get her to pose like you (or maybe you like her would be easier) and then put them side by side!! EEEK!!! I can't wait till my gal gets bigger!